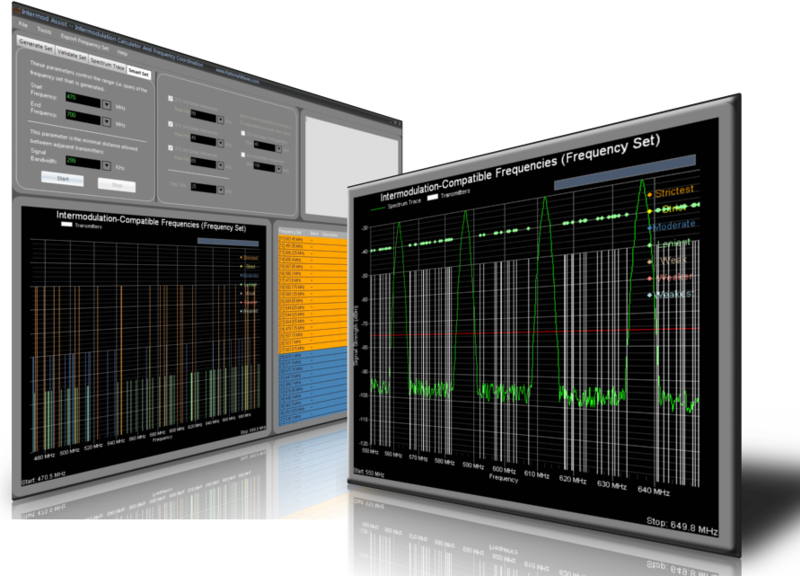 Introducing the latest, low-cost development in RF intermodulation analysis and frequency coordination -- Intermod Assist is a new, ground-breaking software tool specifically designed for the wireless, professional audio industries. Its computational engine rapidly generates frequency sets of intermodulation distortion-free radio frequencies, applying user-defined signal bandwidths and channel spacing. These frequency sets can be used to coordinate transmitter frequencies where the goal is to assign the most reliable channels to your wireless audio and video gear -- that is, to ensure reliable operation of wireless transmitters by assigning channels that are free of intermodulation distortion. In the wireless audio industry, RF interference and intermodulation distortion have become major concerns -- the number and variety of new and different wireless devices that operate in the UHF band space can wreck havoc when it comes to configuring wireless audio gear. In the shrinking frequency space allotted for wireless audio equipment it has become a true challenge to assign interference-free channels to wireless audio equipment. Intermod Assist is an invaluable tool that can be used to facilitate frequency coordination and channel assignments in the most complex RF environments. Intermod Assist saves valuable setup time by computing the most reliable frequencies -- free of interference from intermodulation products. In the wireless audio industry two categories of intermodulation interference are a major concern: (1) transmitter-produced, and (2) receiver-produced. Transmitter-produced intermodulation interference is caused by one or more transmitters that generate a signal in the non-linear, output circuitry of another transmitter -- e.g. via antenna coupling. The intermod product frequency is then re-transmitted from the transmitter's antenna. Receiver-produced intermodulation interference is the result of two or more transmitter signals mixing in a receiver's non-linear, RF amplifier. The resultant intermod product frequency can interfere with other signals (of similar frequencies) that pass through the receiver. As a result, the intermodulation distortion (IMD) phenomenon can degrade the quality of the desired signal being amplified. Intermodulation interference is rarely desirable in wireless communication systems -- particularly in radio or audio processing. Furthermore, it is not something that is readily measurable and avoidable (e.g. using an RF spectrum analyzer). However, the physical basis for IMD is well understood and the mathematical formulas used to describe it are relatively simple -- so, computational methods can be applied to generate frequency sets that are free of intermodulation interference and which mitigate its effect. Intermod Assist is the first to introduce Smart Frequency Sets™ -- a patent-pending method of prioritizing and ranking frequencies free of interference from intermodulation products. The value that a Smart Frequency Set™ offers compared to a generic frequency set is in the way it groups and prioritizes frequencies -- from "best" to "worst". Where "best" means most reliable or least susceptible to interference from intermodulation products, and "worst" means least reliable. When preparing for a live performance the setup typically includes a variety of wireless audio gear -- some more important than others. Employing a Smart Frequency Set™ you can assign the most reliable channels to the most important transmitters (e.g. lead vocals), and less reliable channels to less important transmitters (e.g. back-ground instruments). 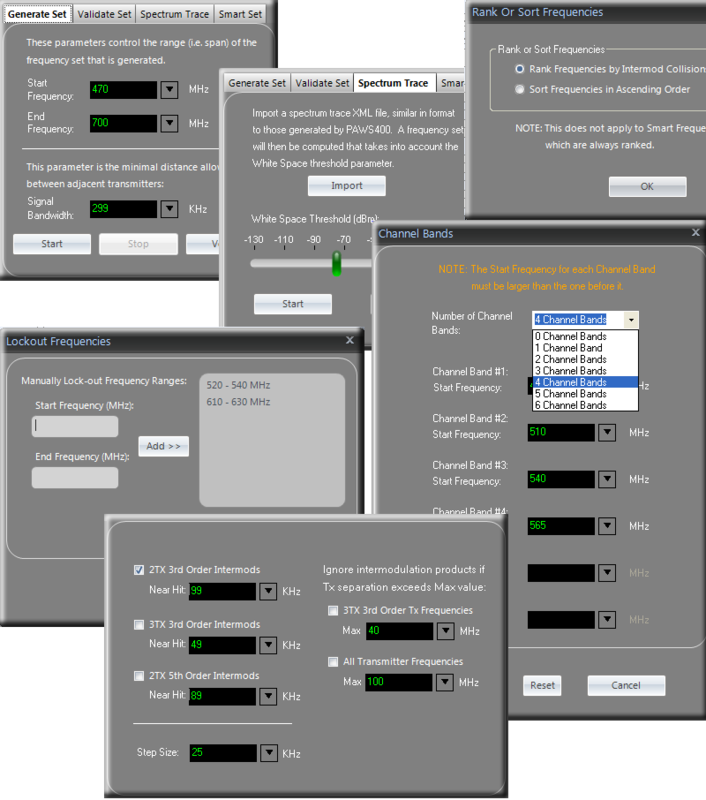 Another advantage of the Smart Frequency Set™ compared to a generic frequency set is that in most situations you'll have a greater number of frequencies to work with and to assign to wireless audio gear, including frequencies ranked at the strictest intermod level that can be assigned to your high priority wireless transmitters. For example, consider a frequency range of 470 MHz to 500 MHz. A generic frequency set generated under the strictest conditions will include approximately 18 frequencies. The corresponding Smart Frequency Set™ will include approximately 33 frequencies. So, not only does a Smart Frequency Set™ give you more channels to work with, it also includes frequencies ranked at the strictest level that you can assign to your high priority wireless transmitters. A generic frequency set is composed of frequencies from a single intermod stringency level and there is no concept of grouping by stringency or ranking frequencies within the set. As a result, a generic frequency set will always need to wrestle with the trade-off between intermod stringency and number of frequencies in the set. If you need more channels then you'll have to relax the intermod stringency (and, hence, the reliability) of the set. Or, if you have need of greater reliability then you'll have to make do with fewer frequencies. On the other hand, a Smart Frequency Set™ includes the best of both worlds -- it maximizes the number of frequencies you get to work with and, at the same time, includes frequencies with the highest degree of intermod stringency. 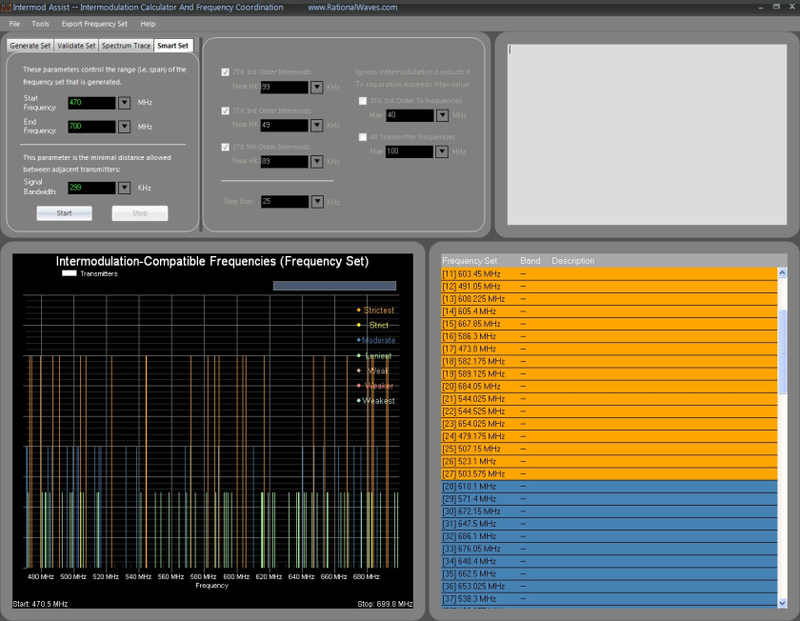 Intermod Assist Intermodulation Calculator and Frequency Coordination software is a unique tool -- it will change the way you approach the problem of intermodulation interference and the challenges of frequency coordination and channel assignment. It includes features you won't find in any other product -- including those that cost many times more. The patent-pending Smart Frequency Set technology introduces a powerful, new technique at your disposal as you wrestle with assigning interference-free channels to your audio equipment. By ranking frequencies by intermod stringency and reliability you can now assign the most reliable channels to your most important transmitters -- without sacrificing on the size of the frequency set and total number of intermod-compatible channels you get to work with. Intermod Assist is a ground-breaking tool -- it will change the way you approach the problem of intermodulation interference and the challenges of frequency coordination and channel assignment. The patent-pending Smart Frequency Set technology introduces a powerful, new technique at your disposal for assigning interference-free channels to your wireless audio transmitters.